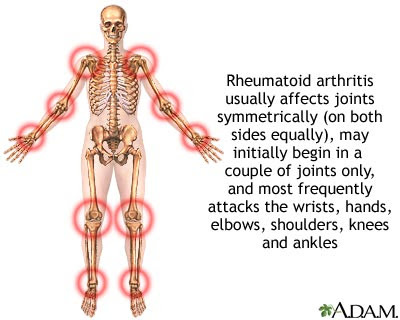 Juvenile arthritis is usually an autoimmune disorder. It causes pain, swelling, stiffness, and loss of motion. Juvenile arthritis is a type of arthritis that affects children. An autoimmune disease is a disease where the immune system attacks the body's own healthy cells. Autoimmune disease can affect many parts of the body and there are about 80 autoimmune diseases. Reasons for autoimmune diseases are unknown but most are looking at a patient's genetics. With juvenile arthritis, it may involve two steps; family history and a virus. Something in the child's genes (passed from parents to children) makes the child more likely to get arthritis, and something like a virus then sets off the arthritis. Juvenile Idiopathic Arthritis (JIA) is the most common type of juvenile arthritis to affect children. As children with juvenile idiopathic arthritis (JIA) grow into adulthood, disability due to disease may adversely affect their ability to achieve educational success. Findings published in Arthritis & Rheumatism, a journal of the American College of Rheumatology (ACR), suggest that functional disability impacts educational attainment, which is key to successful employment in adulthood. Arthritis is a joint disorder characterized by painful inflammation, swelling, and stiffness that can damage joints and lead to disability. When chronic arthritis strikes those under 16 years of age it s referred to as JIA and affects 294,000 children in the U.S. according to the ACR. In the past two decades, studies have shown that early, aggressive treatment with disease modifying antirheumatic drugs (DMARDs) like methotrexate, or biological drugs known as tumor necrosis factor-alpha inhibitors such as adalimumab (Humira), can improve long-term outcomes for JIA patients. "Despite effective treatment early on, some JIA patients enter adulthood with joint damage, disability, and lowered quality of life," explains Dr. Ajay Malviya, a Consultant Orthopedic Surgeon based at Newcastle upon Tyne NHS Foundation Trust in the U.K. "There are significantly higher rates of unemployment in adult JIA patients compared to healthy counterparts, which remains poorly understood." To further investigate the dependency between employment and educational achievement in adult JIA patients, researchers recruited 103 participants who were treated at the musculoskeletal unit at the Freeman Hospital in the UK. There were 22 males and 81 females with a median age of 24 years and median disease duration of 19 years. Participants were surveyed about educational achievement, employment status, and they completed a health assessment questionnaire (HAQ) to measure functional disability. Findings indicate that functional disability as measured by the HAQ was significantly lower in employed patients and in those with oligoarticular JIA. Educational achievement was not influenced by JIA subtypes: oligoarticular (40); polyarticular rheumatoid factor (RF) positive (23); polyarticular RF negative (17); systemic (10) and others (11). Patients who did receive their secondary education certificate had greater success later in life, obtaining more professional or managerial jobs. The team also noted that job stability was influenced positively by educational achievement and negatively by the disability score. "Our study shows the impact of JIA on various employment outcomes," concludes Dr. Malviya. "Further research that helps patients to determine ideal career choices and take into account their disease activity is warranted."